I’ve been in the property development and designing game for a while now, so it’s natural for me to have learned a thing or two (or more!) along the way. But for me, the most important one when designing is to keep the type of client I’m working with at the top of my mind, be it commercial or residential. When designing for a commercial client, there are many facets that need to be considered. Things like the type of business they have and they type of customer they want to attract. Positioning, foot traffic and surrounding retailers all play a part in the design process. But there’s one that supersedes them all – the customer experience. And this is precisely the reason why I admire the work of BIRKA so much. This amazing company is made up of a large group of highly skilled architects and industrial designers. With over 600 projects under their belt, the design aficionados have cornered the market in creating carefully curated designs with exceptional attention to detail, all in a quest to enhance the customer experience. It’s no wonder they’re the go-to designers for some of the world’s most exclusive luxury brands (CHANEL, Dior, Dolce & Gabbana, Prada, Apple and Tom Ford are just a few. There’s SO many more!). WHAT SO DIFFERENT ABOUT THEIR DESIGN PROCESS? BIRKA understand both the retailer and the market they’re in. This knowledge helps them to expertly decide how and where to position their designs to achieve the best impact in getting – and keeping – customers’ attention. The first section is the central makeup area featuring consultation tables, reclining panels and specialty mirrors that automatically adjust light tone according to the season. 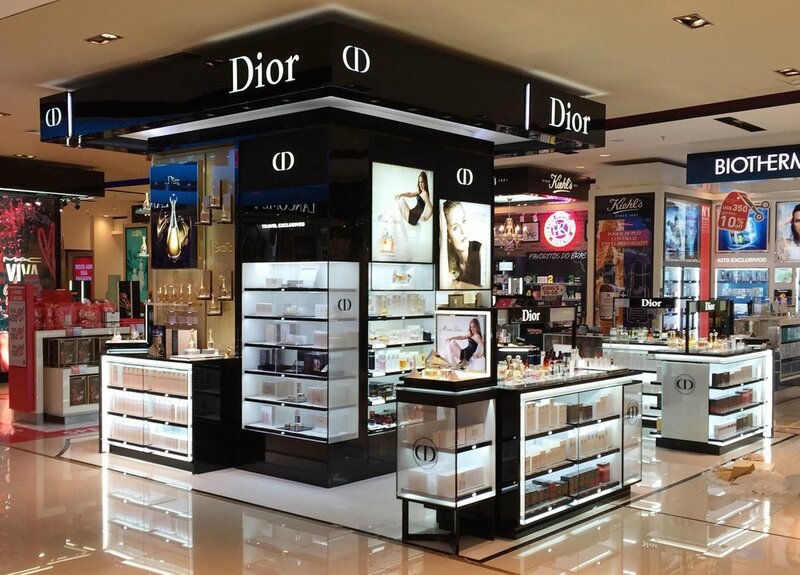 The second is the display of the all-important products, carefully positioned in a circular perimeter around the store to encourage customers to visit each stand. And the last is the exclusive VIP area located behind sliding doors. It’s fitted out with customised LED screens and a tweed sofa so customers can enjoy a more relaxed and intimate shopping experience. BIRKA also fully understood how vital it was to stick to traditional CHANEL colours of black, white and tweed, so these naturally dominate. However, they also chose to incorporate splashes of gold and grey for a hint of warmth and glam. The fabric adorning the walls, doors and lamps was also specially made by Danish artisans to evoke a sense of originality. Finally, all black counters and stands were coated in a deep gloss finish to draw the eye. There’s plenty more I can say about these master designers, but their portfolio speaks for itself! Head on over to the BIRKA website to have a look-see for yourself.